After the Sunday talk show, I fiddled around a bit with the Outside song. It's sounding pretty cool already! As you can see from the waveform, the levels are squashed all to hell. I have not spent any time on mastering -- just ran it through a rock preset on Ozone to make it big and loud. Even so, sounds good, if lacking in dynamics! I tightened up the bass part, added some variation in the articulation, and found a decent-sounding amp model for the part. I re-recorded the guitars for a total of four tracks: two tracks in matching style, and I think I used the 7D:Start Me Up patch on the PodXT. I played open chords on the left track and mostly bar chords on the right with different tone settings on the Strat; these parts are panned about 60% left and right. I recorded a dirty part with patch 10D: Sunshine Of Your Love, which is panned 24% right. 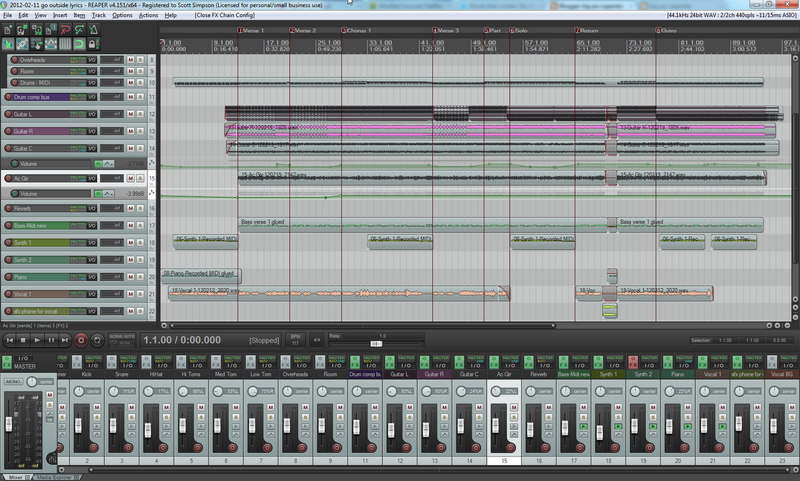 I did one pass with an acoustic guitar and a large-diaphragm condenser, and that's panned 22% left. The dirty and acoustic guitars have a bit of reverb on them to put them in space. I've put the ReaEQ plugin on all the guitar tracks with a high-pass filter to leave room for the bass and the kick drum. In some of my older mixes, I didn't have the good sense to use subtractive EQ to make space for all the instruments, and ended up with cluttered, muddy mixes. I'm also trying to record at lower levels in general. When I first learned about digital recording in 1992, digital-to-analog converters (DACs) weren't the best quality and everything was 16-bit/44kHz at best, so the prevailing wisdom was to record as close to 0db as possible without going over to avoid the distortion and noise that would come from lower-level signals. Heck, in the analog tape world -- which is where I learned my stuff the first time around -- recording hotter is better because of the effects of tape saturation. Well, through the Home Recording Show podcast, I learned last year that today's gear is of such good quality that it's wiser to peak around -6db or even lower, and having 24-bit quality to work with offers even more headroom. Plus I won't have to pull my faders down so far when I'm mixing. 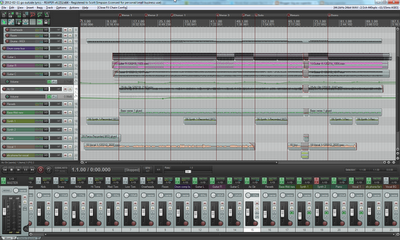 I tightened up the synth and piano parts to clean up some overlapping notes. The piano has the same bit of room reverb. On the woo-woo synth part, I tweaked the patch to have a low-frequency oscillator (LFO) pan the signal back and forth as it plays. I switched drum kits and added a bit of reverb on the snare and room mics. I added a pitch-shift effect to the small voice before the last chorus to make the comeback sound even bigger.